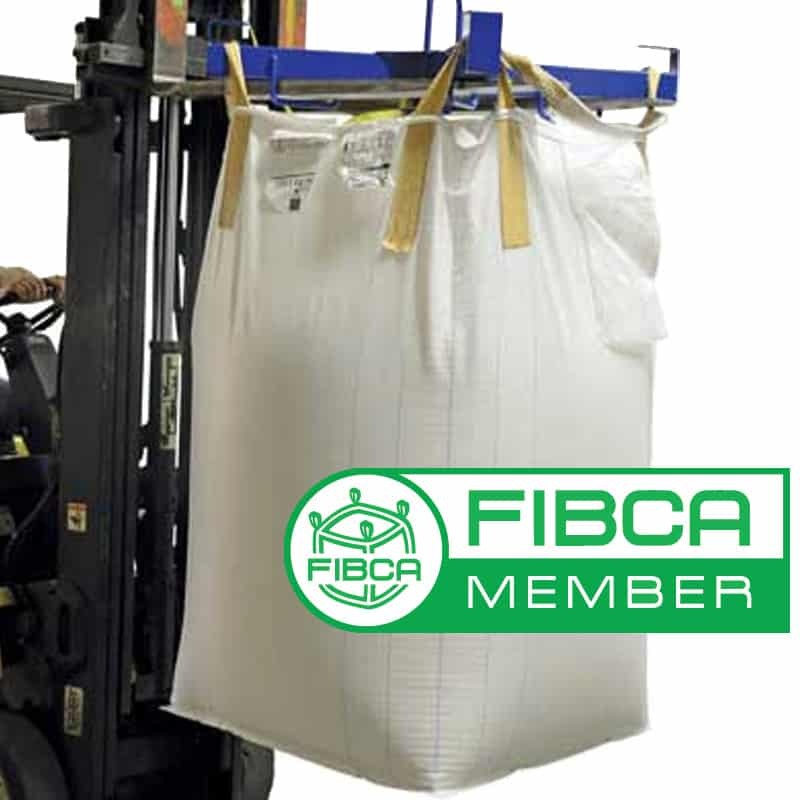 FIBC’s are used for shipping, storing and dispensing products. Standard spouts ensure quick, no-spill filling and discharge of contents. FIBC’s typically feature a perimeter band (band sewn around the outside edge of the top of the bag) to give extra strength to loops when filling. Baffles are pieces of material sewn to the inside corners of a bag to maintain a square shape after filling. The baffles typically have holes that allow the product to flow freely through them so as not to lose bag storage space to empty baffles. FIBC’s may be UV treated to protect them from breakdown especially during storage. The UV treatment is an additive to the resin during the extrusion process. Transporting and loading is done on either pallets or by lifting it from the loops. Bags are made with either one, two or four lifting loops. The single loop bag is suitable for one man operations as there is no need for a second man to put the loops on the loader hook. Emptying is made easy by a special opening in the bottom such as a discharge spout or by simply cutting it open. Most FIBC’s are considered single use containers unless they have a 6:1 SF (safety factor). If an FIBC has a safety factor lower than this, the fabric might be worn down and the loops could be breaking down as well. A 6:1 SF designates the bags are rated to hold 6 times the amount of the bag’s SWL (safe working load). This means that a bulk bag’s safe working load is the amount of weight that the bag is rated and tested to hold safely. Another term often used for bulk bags is UN certification. This is a test that puts the FIBC through a set of rigorous test such as drop test, tear test, etc. The certification is usually good for one year from testing.